One of the best ways for a kid to spend some time unwinding on a long summer day is in a fantastic fort or a terrific tent or teepee. Of course there’s the classic pillow and blanket forts that will do the trick, but we’ve rounded up some amazing options that will have kids swinging from the trees… literally. Check out these five great tents that make the great outdoors tent-alizing! The Treepee is a contraption that will fill kids with glee. It’s a tent, a swing and a trampoline all in one! The Hugglepod is another super fun place for kids to hang around — it may be used indoors or outdoors and it’s a perfect haven for summer days. These five fantastic DIY forts will keep the kiddos busy while teaching them the basics of construction. The Thicket is a sustainable dwelling that will suit both adults looking for a serene retreat and kids who want a sacred space all their own. You can build a priceless and adorable teepee for your child for under $15. This cheery organic cotton teepee inspires imaginative play no matter what the weather! In addition to all of these happy dwellings, here are several imaginative and inspiring activities to keep kids entertained indoors if you happen to be in the midst of a heat wave! One of the best ways for a kid to spend some time unwinding on a long summer day is in a fantastic fort or a terrific tent or teepee. 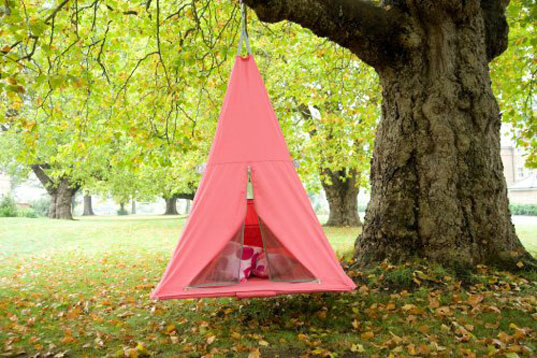 Of course there's the classic pillow and blanket forts that will do the trick, but we've rounded up some amazing options that will have kids swinging from the trees... literally. Check out these five great tents that make the great outdoors tent-alizing! The Treepee is a contraption that will fill kids with glee. It's a tent, a swing and a trampoline all in one! The Hugglepod is another super fun place for kids to hang around -- it may be used indoors or outdoors and it's a perfect haven for summer days.